On January 18, 2012, by a vote of 45-5, the Chicago City Council approved a controversial ordinance for Chicago public protests in anticipation of protests against the NATO/G8 summit in Chicago in May 2012. Only two mild provisions of the ordinance were removed at the behest of activist outcry, but the vast majority of the draconian rewrite of existing rules is now local law. Provisions include raising of fines of violations, heightening insurance and registration requirements, imposing severe restrictions on sidewalk actions, and redefining "resisting arrest". Read more. 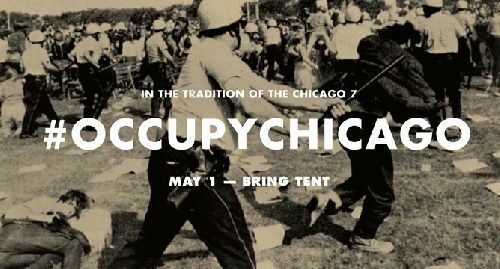 Meanwhile, Adbusters magazine, undeterred by these local developments, has announced a call "In the Tradition of the Chicago 7" to "#OccupyChicago, May 1 -- Bring Tent". Adbusters was the originator of the Occupy Wall Street protest in New York City that swiftly grew to become the worldwide Occupy movement, and their callout for an apparent month-long series of Chicago actions echoes the original announcement of Occupy Wall Street. Read more.